Location: Heighway Pinball, Adare, Co. Limerick, Ireland. 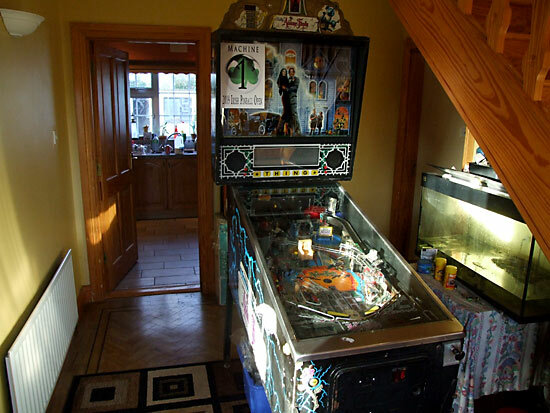 This was the very first Irish Pinball Open and it took place as part of a three days pinball meeting at the home of Andrew Heighway from where he runs Heighway Pinball - a pinball machine supply business. There was a smaller get-together last year with 8 people attending in total. 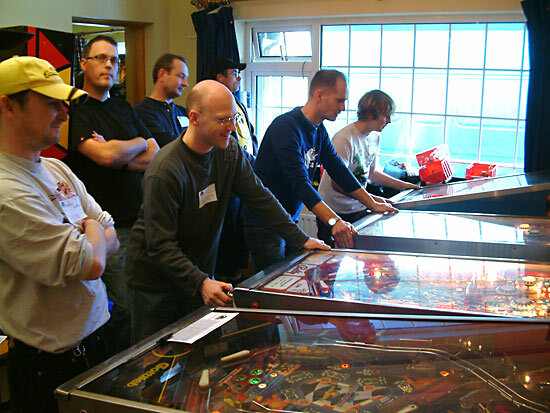 The success of that event combined with the eagerness for competitive pinball and a larger number of expected guests resulted in Andrew asking Pinball News to organise a new Irish Pinball Open for 2009. 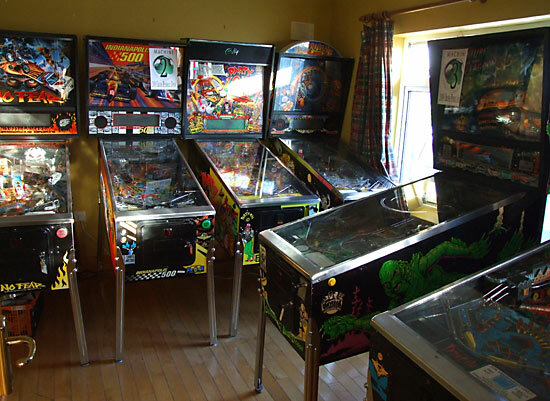 There is no organised pinball scene as such in Ireland, so all but one of the visitors for the weekend flew in, drove or took the ferry from various parts of the UK. England, Wales and Northern Ireland were all represented with Andy himself doing his best to fly the flag for the host nation and Phillip making the trip all the way from Switzerland. 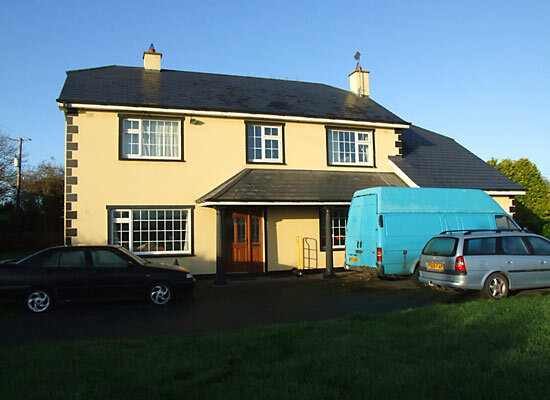 Guests either stayed at the house or at a near-by bed & breakfast establishment which got very positive reviews from those who resided there and enjoyed their enormous cooked breakfasts each morning. Andy also provided huge quantities of drinks and snacks for his guests to dip into over the course of the weekend. Those who stayed at the house also got scrambled eggs on toast to start the day. Andy had 18 machines set up to play over the three days. They were arranged in various rooms all over the building and the view from the front door gave new arrivals a taste of what to expect in the rest of the house. Sure enough, two rooms at the front of the property contained 11 machines between them. 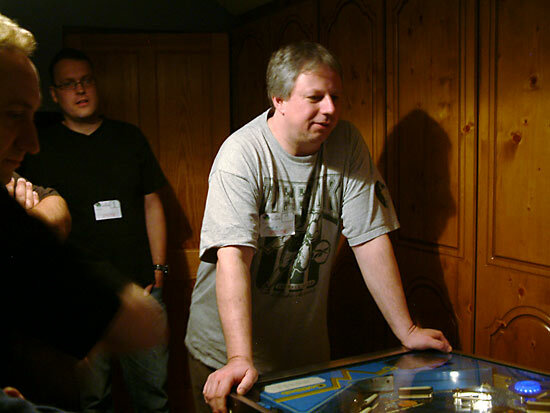 Andy had worked with Phil Docker late into the night in the days preceding the meeting to get the games working and ready for a punishing weekend of prolonged play. Another room on the ground floor featured a Rollergames, a Banzai Run, a Checkpoint and a Sega Daytona sit down driving game while upstairs there were three more classics - a Black Hole, a Defender and a Firepower. 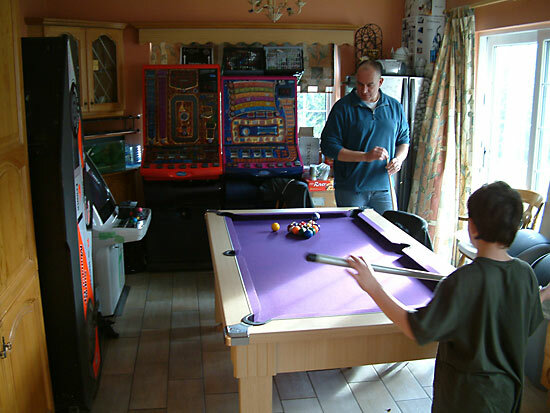 The kitchen table also doubled as a pool table when not being used for food and drinks, while next to that were two fruit machines and a couple of videos. Most guests arrived on Friday and soon started practicing ahead on Saturday's 2pm start of the Open. In the evening, some of players took a break and enjoyed the short walk down to the end of the road where two pubs awaited. 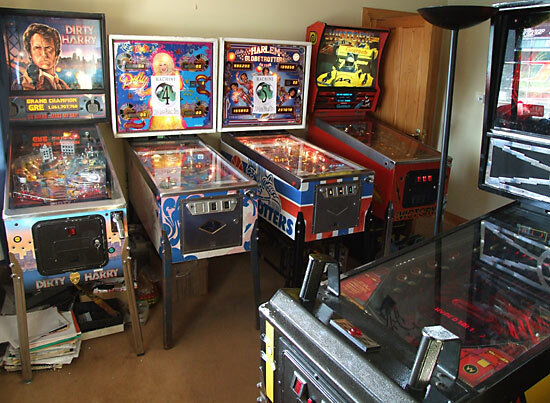 There they met up with some new arrivals and (eventually) returned to the house for dinner and more pinball into the early hours. 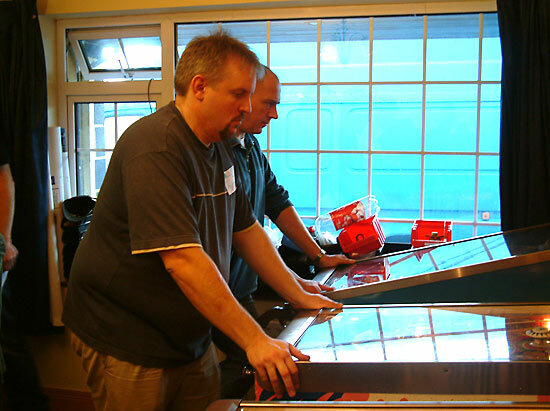 Saturday was Irish Pinball Open day and Andy had arranged for laser-etched crystal trophies to be awarded to the top three in the tournament. 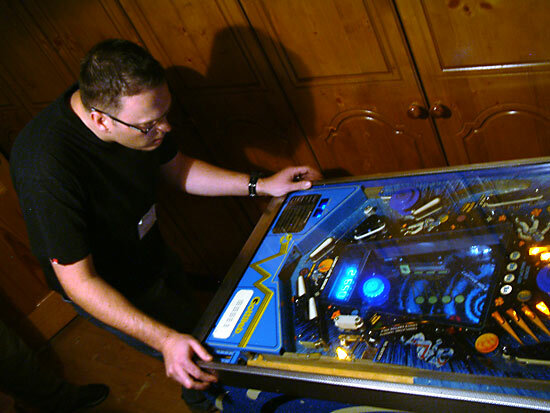 The tournament was organised by Martin Ayub of Pinball News and it consisted of a ranking-based qualifying round followed by a series of modified double-elimination matches. All 15 players who were present for the duration signed up for the free event. 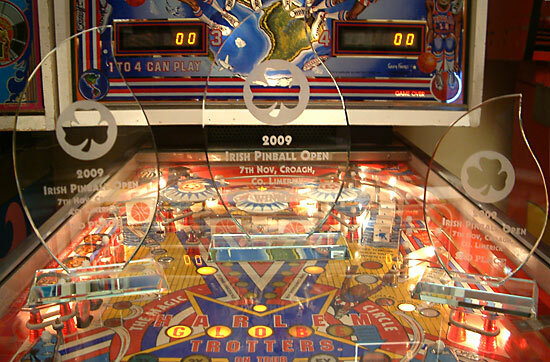 The machines were played in rotation by groups of 2 or 3 players who recorded their scores after each match, before moving on to the next. Everyone's scores on each machine were ranked and ranking points awarded, with 100 for the top score on a machine and a sliding scale for lower places. The 12 players with the best ranking points total from all 6 machines moved on to the play-offs. Martin had brought his laptop with him and had installed the EPC 2009 scoring system under the guidance of Phillip Eaton in Switzerland, who co-developed it and talked him through the installation. 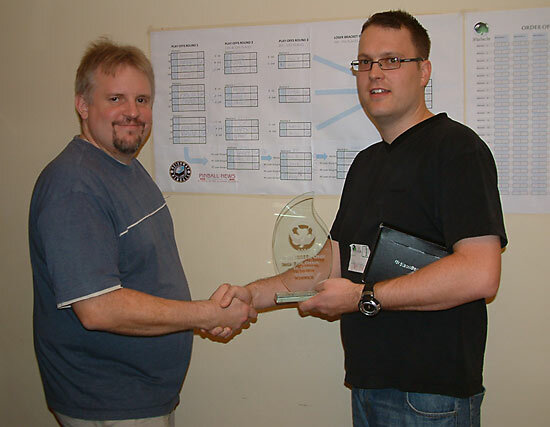 Martin also brought a 19-inch LCD monitor with him to display the results so players could see how the tournament was progressing, while the two of them typed in the scores. Tournament play was interrupted at one point when it all got a bit too exciting for one of the electrical breakers which tripped and killed the power to everything - except the laptop of course which carried on with its internal battery. Once power was restored, scores on completed games could be recorded while games in progress were restarted. There was an additional - but planned - break in play mid afternoon when some hot food Andrew had ordered arrived and competitors took a few minutes out to enjoy it before getting back to their qualifying games. 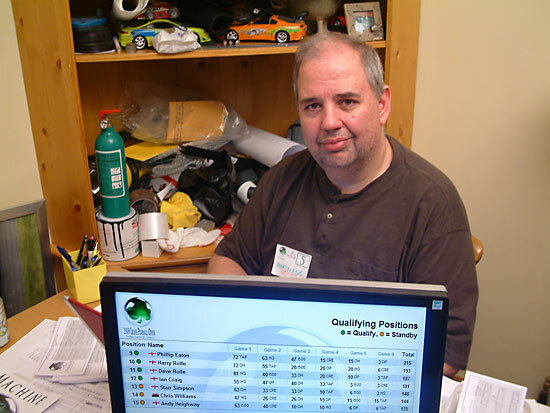 When all the scores were in and the qualifying positions were decided, the tournament's progress moved off the computer and onto the wall. 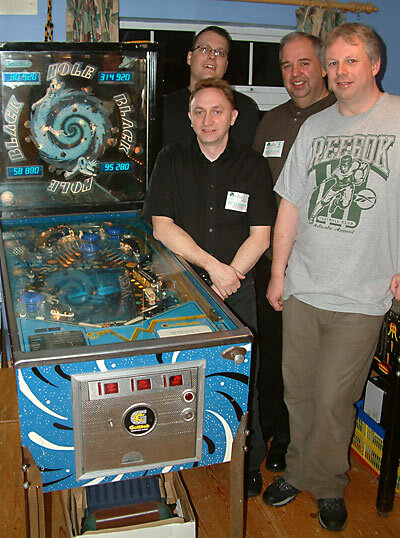 The 12 qualifiers were divided into 3 groups of 4, each of which played a single 4-player game on their allocated machine. The top three from each game continued into the next round while the lowest scorer dropped down to the loser round. The winner from each group's match continued on the same machine while the lower places changed machine each time. In the next round the top two continued while the third placed player dropped down to join the winner of the first loser round match. The third round saw the winners from the three groups going into the final, while the three losers joined the winner of the second round loser match to play for the fourth spot in the final. Peter Blakemore had an unbeaten run on Indianapolis 500 to secure his spot in the final. Martin Ayub placed second in the first round on Addams but won twice on Creature to get his final place. Nick Marshall came first and second on Creature before winning on Addams to take the third final place. After coming third on Indy 500 in the second round, Mike Parkins went on to win on Dolly Parton and then Harlem Globetrotters to win the loser bracket to take his place in the final four. The machine used for the final was also a mystery until all four places had been decided. 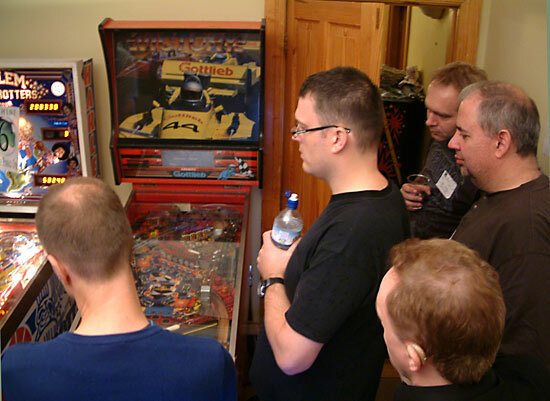 Andrew Heighway chose Black Hole as the final machine, so the players and spectators crowded into the upstairs back room to watch the decider. 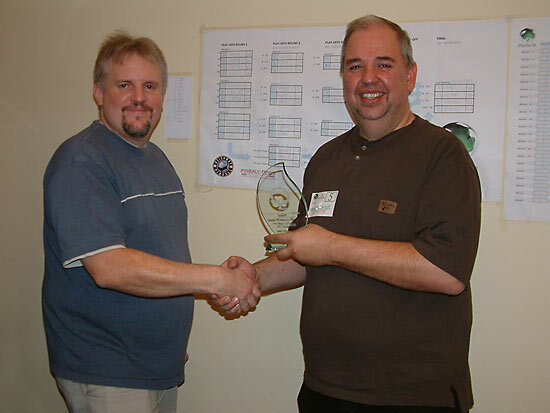 Mike Parkins was first to play based on qualifying order preference. Only Nick Marshall got a real grip on the game as he got some good lower playfield scoring while locking balls on both levels. Nicks total of 314,920 after 5 balls was easily enough to win. Martin was the leader of the trailing pack with 95,280 just ahead of Mike on 90,520 with Peter - who never got much of a chance to rack up a decent score - 4th on 58,880. 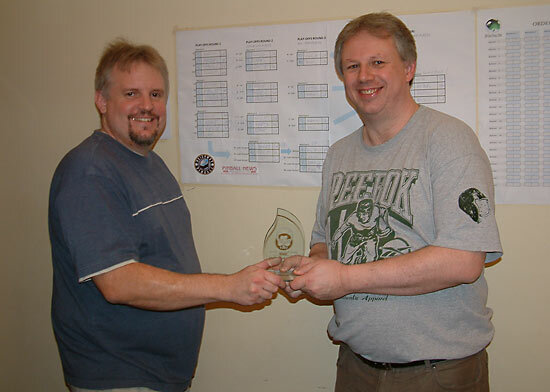 So Nick Marshall became the first Irish Pinball Open winner, receiving his trophy from host Andrew Heighway. Second was tournament organiser, Martin Ayub. In third was Mike Parkins. And in fourth place was the hitherto unbeaten Peter Blakemore. 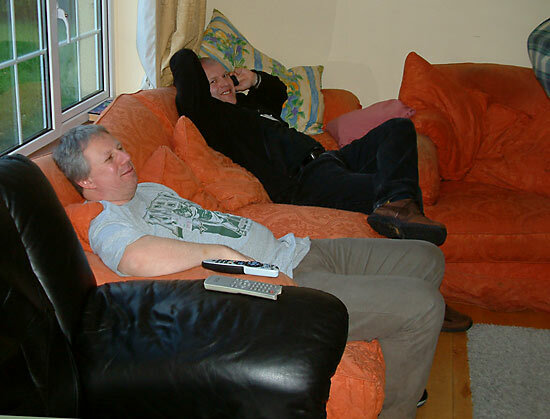 The pressure took its toll on some players who took a relaxing break before everyone headed into Adare for dinner or down to the pub to spend a few hours enjoying the rugby and the local hospitality. After the pub it was back to Andrew's for more pinball into the early hours. Sunday was time to start the journey home for most visitors. Some left at breakfast time while others stayed until mid-afternoon. 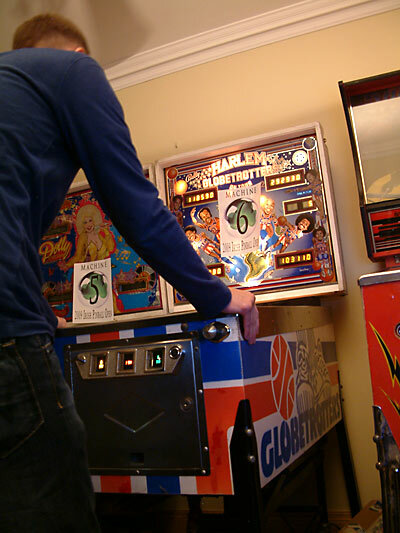 For those who remained past midday, Martin had brought some prizes donated by Todd Andersen of Pinball Renaissance in Minnesota and held a mini-tournament on Harlem Globetrotters. Players had to play cross-handed, so despite being set on 5-ball play, none of the games lasted long. 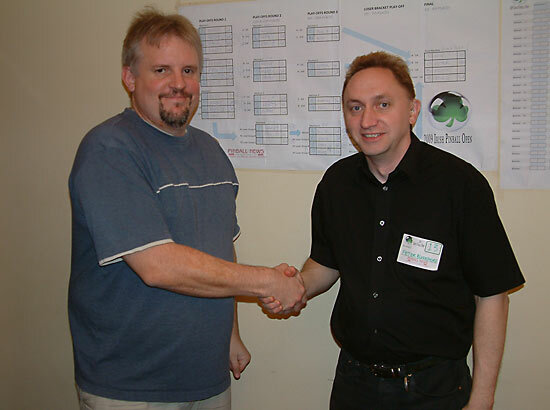 10 players took part and the winner was Eddie Mole who won a Frankenstein translite. Host Andrew was second and collected a PAPA hat. 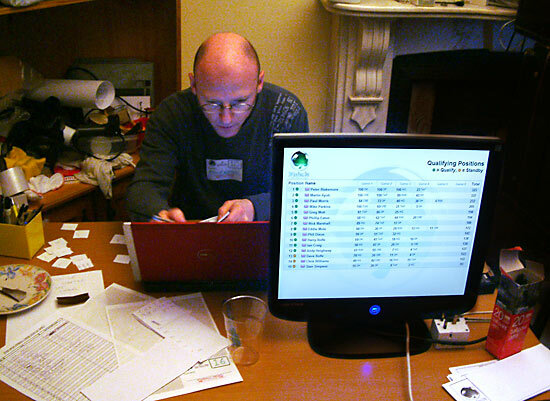 Phillip Eaton was third and took a Spongebob Squarepants MP3 player back to Zurich, while Martin was fourth but as he was organising it, gave his LCD Tetris pen prize to fifth placed Peter Blakemore. After that, it was time to pack away, clear up and head for the airport as the weekend of pinball came to a close. It had been an undoubted success with everyone thoroughly enjoying their weekend away. Andrew was a very generous host and his machines held up well, although with a house full of clued-up pinball people, if anything did wrong the glass was off, the problem fixed and the game back in action before most people even noticed. 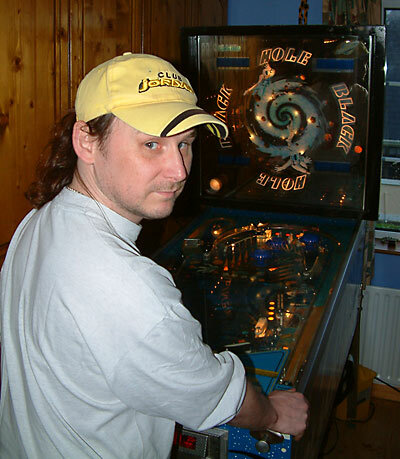 Talk has already begun about the 2010 Irish Pinball Open and hopefully the success of this year will grow the event further, perhaps even getting some of the locals more interested in playing, both for fun and competitively too. The 8 visitors from the 2008 meeting grew to 20 this year, so hopes are high the 2010 event can be bigger still.